One of my clients wants to pay me in advance. How can I reflect this in TO3000/Projetex and keep track of their spent amount? 1. You can just create a payment equal to the received amount by going to Client > Payments and clicking the New button. 2. Then your payment will be created, but all the money will be unlinked (unspent) as you can see in Picture 1. 3. When you have performed some work for this client, you can create an invoice, then open this payment and link it with the new invoice by switching to the Linked with Invoices tab (Picture 2). 4. 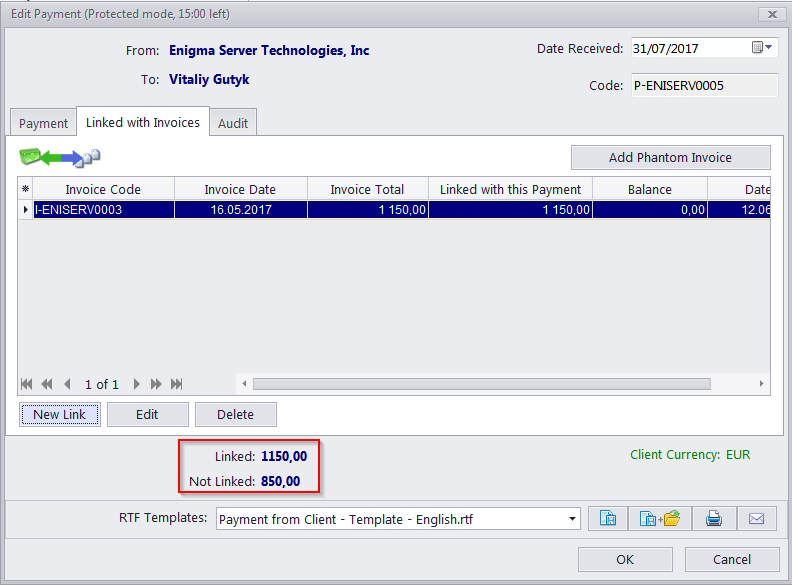 Now you can see that one part of this payment is already linked with invoices (spent) and the other one is still unlinked (the unspent money of your client). An example is in Picture 3. 5. You can track their spent and unspent amounts and continue steps 3-4 until all the money from this payment is linked to your invoices.